I grew up with two brothers and our family moved cities almost every two years until I was 13. New cities meant new schools. New schools meant having to make new friends. Two brothers and a whole lot of boy cousins when we visited our home city meant being left out of things for the most part. With this background you would think that I would be very comfortable being alone. But I wasn’t. No, I did not fear robbers or ghosts. But the thing that I was most uncomfortable was with having myself for company. So as much as I enjoyed reading, all the times that I was alone, I would make sure I was either talking to someone on the phone or mindlessly watch television. Although I never starved – no one the contrary, I binged – I would never have regular meals, where I would lay the table and sit down for a meal. And I would stay up really late into the night too. All this despite the fact that we had settled in one place and I had numerous friends. To me be alone was synonymous with being lonely. It is only in the last few years, when I realized that I am really an introvert, and the number of friends I have can be counted on one hand, that I have begun to enjoy the times I get to be alone. As much as I miss my husband when he is out of town for a few days, I revel in my own company. Thankfully, even when we’re together, we make sure to ‘keep spaces in our togetherness’ (yes, I’m borrowing from Khalil Gibran!). Looking more closely at the change in my behaviour, I’ve realized that it has also to do with the choice I’ve made to be authentic and to strengthen the connection with people with whom I can be myself. I am no longer afraid to cut people off from my life, should I find that our connection is inauthentic. So far, I’ve not extended this to family, but I’ll admit that it’s hard to keep a connection with some members of my family too. I know that many people find this aspect of my behaviour hard to digest, but so be it. I’ll be polite and do my duty but that’s all. I am unapologetic about this. Since I’ve bid loneliness goodbye, it’s easier to make these choices. What about you? Does the fear of loneliness make you put up with bad behaviour from others? Or does it make seek a lot of friends, often compromising on the quality of the connection? Or do you enjoy being alone? Linking into Write or Die Wednesdays hosted by Mia of The Chronicles of Chaos and Vashelle of Shelly’s Cabaret a bi-monthly creative writing prompt. This whole para Corrine,I could have written it.Though not as well as you.I have done exactly the same–cut off some at the risk of being alone but I wanted to be my genuine self.It is very fulfilling. We have similar backgrounds. I grew up with 2 brothers, lived in a neighborhood full of boys, and although I had girl cousins, they lived in a different state, so I was always with the guys. I guess that’s why I’ve always preferred having guy friends over girlfriends, and because of that, have always been alone… (There comes a time in a “guy friend” relationship when one wants to be more than friends while the other does not lol). I have always enjoyed my time alone. I rarely am alone anymore, but my favorite times are late at night when everyone else is in bed. That’s my time to do whatever I want without any interruptions. I’m getting caught up today. I’ve been out of town for the last week. Have a great week. Colette wrote: “There are days when solitude is a heady wine that intoxicates you with freedom, others when it is a bitter tonic, and still others when it is a poison that makes you beat your head against the wall. ” I would agree with this, solitude and loneliness are two sides of the same coin. To ‘keep spaces in our togetherness’, lovely thought isn’t it. There is a lot of difference in being alone and in being lonely. Since moving to London, most of my family and friends have commented, with much concern, that it must be lonely out there. But in fact, I am really enjoying time with myself. In the last 6 months I have realized that though I am perceived as an extrovert, and I am in ways, I only have a handful of real connections who know, admire, accept and understand the authentic me. That’s all that matters. I’ve always said there was a huge difference between being lonely and being alone! I love having alone time and am rarely lonely. Your post brings up a lot of good points about the two!! I think it’s completely possible to be lonely in a crowd or even when you are with someone. Being ALONE, now that’s a different story. Being alone allows me to get to know who I am and that always leads to some interesting stuff!! Well done! Thank you for sharing your personal journey of loneliness with us. Being an Army Brat, I moved around every two years until I was 13 as well! And since I was an only child until I was almost 9 years old, I was used to and comfortable with being alone. Because of that, I *NEED* alone time, which seems counter-intuitive, because I think I’m an extrovert by nature. I love interacting with people for short bursts, but I definitely need to withdraw and recharge. Here is why I love reading other blogs. I find people who have so much in common with me, and I feel it’s okay to be who I am. Except for the moving around part we are so much alike. This year I had three people call me out of the blue, after years of “bad” friendship, who suddenly wanted to strike up again. I said no. The younger me would have been a glutton for more friendship punishment, but I realized I don’t want toxic people around. I love my dearest friends and I am loyal to them as well. It’s all about being who we are, being true to ourselves. Trying to be the best people we can be. And the introvert part is definitely who I am. I’d rather be alone than in the company of someone who is not a true person. Yup. I surely loved this piece. I left a comment but don’t know where it went. I am an extrovert but I also like my alone times. And I also have a handful of good friends with whom I can be the real me. But sometimes loneliness does creep in. I was isolated as a child so I thought I had learned what some might view as hermitish tendencies. That certainly had its influence, but I am almost exactly in the middle of the I/E spectrum. I love being with like minded people and people watching is delightful, but I have to be alone to recharge my energies. It is the “power structure” of my mind and body. I think it is a trait, like brown eyes, or the ability to curl one’s tongue. I have learned to celebrate self and friends with my own “social pace.” A wonderful, thoughtful piece, Corinne. I used to be an extrovert, but life made me an introvert. I enjoy being alone, I will say though I have moved to England where I have absolutly no friends, and my friends are an ocean apart from me, so I do miss going out for a movie with friends, or cooking for them at my place, and that makes me a bit sad. Though I wouldn’t say that I’m an introvert, I would most definitely rather be alone than spend time with the wrong people. I find that being in a crowd in which I don’t “fit” makes me feel far more lonely than being on my own! As an introvert, too, Corinne, I have no problem with being alone; in fact, I enjoy the moments of solitude greatly as it provides time to think, reflect, write, and pray. Of course, it doesn’t mean I don’t enjoy other people, but like you, I’m selective as to whom I choose to spend time. Blessings, my friend, and thanks for the good thoughts here! I’ve always been in extrovert and I don’t know that I’ve ever been lonely but I have longed for family and friends that I miss.. I suppose I keep so busy that alone time is difficult to find, let alone a moment to feel lonely. Interesting post. I’ll be thinking on this for a while Corinne. I’ve been scheming to be “alone” for as long as I can remember. I have a huge family and in my village, being is like being Smith, so there was never a shortage of cousins offering for company. 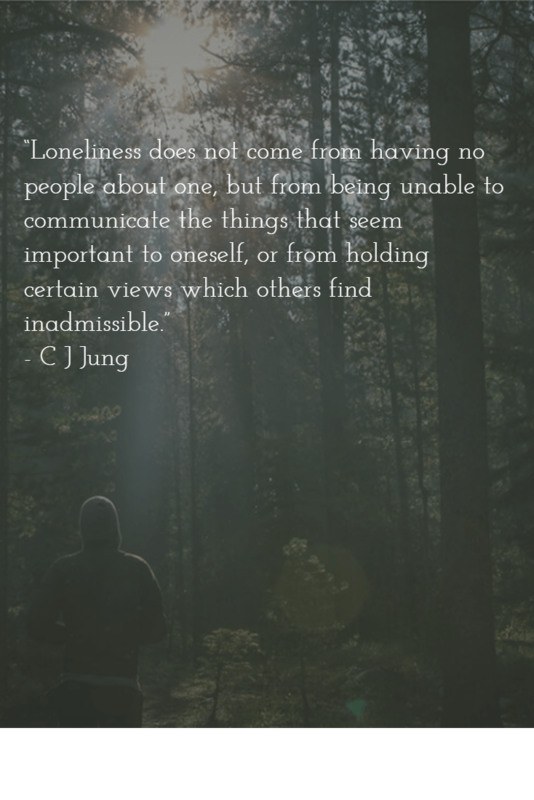 I couldn’t articulate what alone vs lonely meant then. What I knew was that, being alone was seen as anathema in the community and I preferred to walk alone to and from school. Some days I dragged my feet on the way home from school so the other kids from my neighbourhood could walk on ahead. I hid in awkward places (including the clothes cupboard in our guest bedroom or even in the shower), so Mma and my endless parade of cousins couldn’t find me and I wouldn’t have to be sociable. My siblings had no interest in disturbing my peace, thank God, and sometimes pretended they hadn’t seen me when I was hiding. This was really, really good! My dad was in the Army for years and we moved every 2-3 years, too, until I was 14! Then I just kept moving around. I never had trouble being alone, and still don’t. I do enjoy Alpha Hubby but when he has to go into the office once or twice a week, I also revel in my alone time! I can go an entire day without talking – but then I attack him when he comes in the door, just to talk together. I love this: “…no longer afraid to cut people off from my life, should I find that our connection is inauthentic…” – this is what I’ve been doing the past few years. I’ve known some people for years but I finally realized their friendship was not feeding my life with positive aspects – they were toxic. So I have begun that cutting out and life has been so much more peaceful. It is just too short – time – to waste on people who do not input positive into your life. On the opposite side, I try to be a person who imparts positive!! GREAT post. I, too, am an introvert. Fortunately, I’ve never minded my own company – a true blessing as a much younger child than my brothers and female cousins. It’s an effort to meet with friends as an adult but I’ve been making a better effort. In fact, I flew across the United States last month to meet with four beloved writer friends. What a joy! They understood when I took my camera and headed out to the mountaintop for some alone time yet every meal was shared with joy and laughter. And I got some awesome animal photos! Best wishes. I need a certain amount of alone time or I go somewhat buggy. This is why I love the Internet – learning about other people and their personal journeys. What you have said here is so relatable for me. Just over a year ago, I took that extra step and extended my ‘dumping’ of non-authentic people to a sibling. It has upset my whole family but I got sick of how I had been treated all my life and spoke up for myself. I accept that everyone is human and I feel sorry for the real person underneath the bitchy behaviour. Now, in later life, I have come to the conclusion that loving people as humans equal to ourselves does not mean we have to accept their poor behaviour. I avoid bitchy behaviour and attitudes like the plague now and am so much happier. I have some lovely friends who I value but I spend far more time alone than I do with them because I like it that way. Aloneness is pure heaven for me too and I absolutely LOVE this post Corinne. And Kahlil Gibran? Genius – I keep The Prophet in my bedside table all the time. In our younger days, hubby and I were social butterflies with a large circle of “friends”. Then, we fell on hard times and our “friends’ deserted us. Now, we much prefer hanging out together, or with a select handful of true, long-term friends. We also ‘keep spaces in our togetherness’, which is important for any successful relationship.